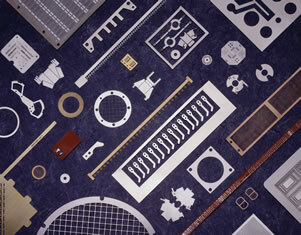 Chemically Etched Parts: Great Lakes Engineering boasts over 20 years in photo chemical etching and metal etching technology. In essence, this is the process of printing (photo-plotting) a pattern on a metal foil and immersing it in a precise combination of chemistry in order to eat through (etch the pattern into) the metal. Many of the same products can be manufactured using different processes. Great Lakes Engineering has the experience to determine which process is appropriate for the application, tolerances, longevity, durability and cost. We take great care to ensure the process is environmentally safe. No major investments in dies, die maintenance and repair costs. No long lead time for tooling. Lower cost, we utilize a photo tool that is more efficient and far less expensive than hard tooling. The process of photo chemical machining, also known as photo chemical milling or photo etching is a common milling process that utilizes chemicals in order to fabricate sheet metal in a desired shape or pattern. The process dates back to the 1960s and has only increased in technology and popularity. Since then as it has grown from a simple offshoot of the circuit board industry into a process that is used to make intricate and complex parts for a number of different industries. The photo chemical process starts with the desired shape of the product being printed onto photographic film. Once a metal material is selected it is cut down to size, coated in a photoresist and is placed between the two sheets of film and they are vacuum sealed together. From here the plate is exposed to a UV light that causes the photoresist in certain areas to harden. The extra photoresist is washed away, leaving only the areas that are to be etched behind. The etching line is commonly a multi-chambered machine that has conveyors in order to move both the plate and the numerous spray nozzles that are a part of the machine. The etchant that does the etching is usually some form of acid depending on the material used that eats away at the exposed metal very quickly. Once the chemical has done its job it is neutralized and rinsed away, leaving behind the desired part. The photo chemical machining process is used in a number of applications across a wide range of industries as it can be used on just about any metal or alloy on the market, regardless of hardness. 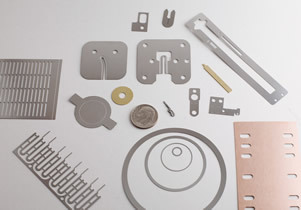 Whether your application calls for brass, copper, steel or some other form of metal you can be sure that the photo chemical machining process will get the job done. Photo chemical machining is often used in industrial applications such as screens and meshes, masks and apertures, fuel cell components, microwave circuits, electrical contacts, encoders, semiconductors, and many other parts or products. One of the biggest advantages of the photo chemical machining process is that it doesn’t cause unnecessary damage to the material as it only impacts the exposed areas of the metal, unlike other methods which use hard tools to get the job done. On top of that, the photo chemical machining process is able to handle applications where other methods may fail, such as semiconductor leadframes which are far too complex for other processes. We are able to work with just about any application and would love to hear about yours to see if we can provide a photo chemical solution for you. In general the turnaround time for a photo chemical machining process is quick in comparison, depending on the material used as a thicker metal will take longer to etch than a thinner metal. Here at Great Lakes Engineering you can count on our years of experience to deliver you a high quality product with a quick turnaround. With over 20 years in the industry you can count on us to know the right chemicals to use with your desired materials. If you have any questions about our photo chemical machining process, please contact us and we would be happy to assist you as best we can. Above you will find a list of materials that we are able to use within our photo chemical machining or chemical etching process along with the benefits of the process. © Great Lakes Engineering, Inc. | GLE is an ISO9001:2008 certified manufacturer.